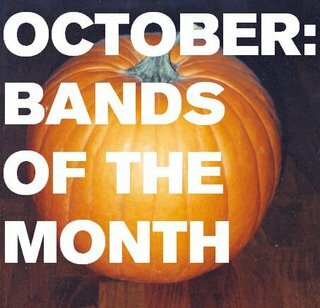 >October’s Top Five Bands From A New Band a Day! Perhaps music is a bit like TV, in that, as autumn slips by and winter looms large, the programmes shown get better and newer. This month has been the most varied, exciting and downright unusual on A New Band A Day – EVER! 1) Awesome Wells – awesome name, awesome band. Puns galore in their name, which was almost enough to win that coveted #1 spot. Yum. More fantastic bands coming in November! Posted on November 3, 2008 by Joe Sparrow. This entry was posted in Uncategorized and tagged Round Up. Bookmark the permalink.